Give a kid a fish stick, you feed them for a night. Teach a kid to bake a salmon filet, roast broccoli, and make a salad, you’ve given them the skills to eat healthy for a lifetime. 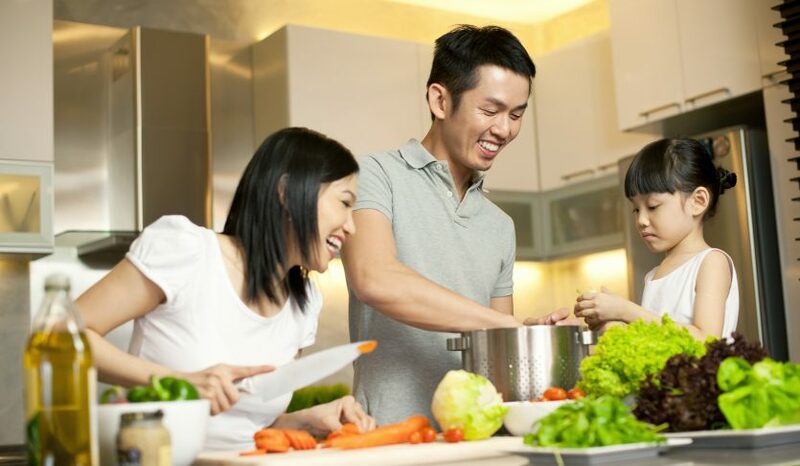 Cooking as a family really can provide significant, sustained benefits for your children. That’s easier said than done, though. Just reading the phrase “cooking with kids” might make your mind conjure a mess of epic proportions. Noodles on the ceiling. A sauce waterfall tumbling off the counter. Sticky hands and a messy face. With proper preparation and patience, cooking with kids won’t turn into a kitchen nightmare. And your children will fill up on life-long skills and short-term benefits. It will make any minor messes or stresses more than worth it. Cooking is an important life skill. Kids who don’t learn how to cook aren’t likely to starve as adults. There are ways to get food. But cooking isn’t an extravagance. It’s a skill that can impress, inspire, and empower kids and adults alike. It helps create healthy eating habits. Cooking at home is always better than eating out. And research keeps coming to the same conclusion—cooking and eating at home develops healthier eaters. That means more nutrient-rich foods (fruits and vegetables), lean proteins, grains, and fiber. Cooking and eating with your kids also helps you set an example for healthy eating that kids can mimic (sensible portions, good choices, and more). Makes weight management easier. Healthy weight goes hand in hand with healthy eating habits. Eating at home also makes it easier to avoid fried, fatty, and sugary foods. So, it makes sense that studies link family cooking and eating to healthy weight in kids. Cooking improves other skills. Reading and math aren’t the first skills you connect with cooking. But reading recipes, counting ingredients, and measuring are integral parts of food preparation. Communications skills—like language and listening—can also be improved when kids cook with their parents. It promotes better academic performance. 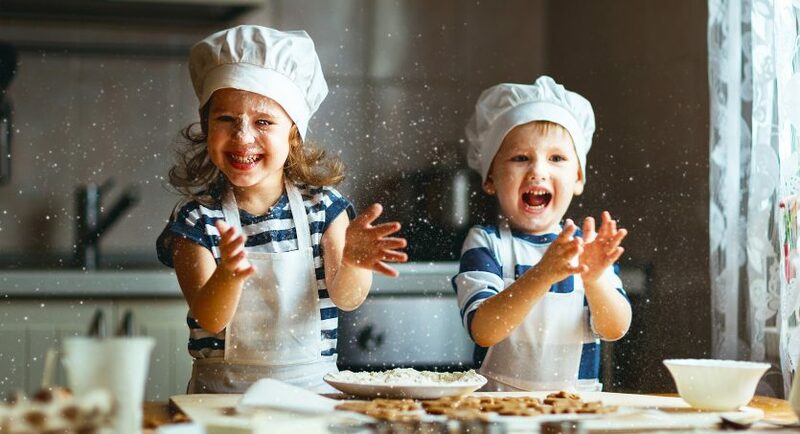 There could be a connection to the skills kids acquire while cooking. Studies show that kids who participate in family cooking and eating test better and have bigger vocabularies. Acts as a substance-abuse deterrent. It might seem like a stretch, but there’s research to back up this benefit. Studies have found that kids who eat with their family are less likely to abuse drugs or alcohol. Cooking results in more adventurous eaters. Kids can be picky. And that’s not a good thing. Picky eaters can miss out on a lot of important nutrition. But cooking as a family helps kids get more excited about food. Kids are more likely to try the food they’ve helped make. This helps develop a healthy relationship with food and an adventurous palate. Fosters connection and conversation. Cooking with kids sets up quality family time. You’ll have a chance to talk to your kids, teach, listen, and connect with them. These conversations over meals—from chopping to chewing—helps bring families together. You’ll serve up a side of confidence for your kids. Making a meal is an accomplishment. Seeing ingredients turn into a delicious dish is a big deal for kids. Cooking as a family helps kids feel like they helped and accomplished something. That can lead to a boost in confidence. You know why you should be cooking with kids. Now it’s time to talk about the how. And it all starts with meal planning. The whole family should have input on the menu. It’s only fair. Kids who are involved from planning to putting food on the plate will be more connected to the meals. And they’ll learn even more healthy habits. You can let each member of the family pick a main course they’d like to make. Then you can go through the ingredient list to maximize the nutrient content. It’s also a chance for kids to learn what’s in the food they love and how to make healthy choices. The opposite approach works, too. You can start by having kids make a list of their favorite ingredients. Then design a delicious meal that highlights what they already love. A few more tips can help you prepare for cooking with kids. Shoot for a few nights a week for family cooking. Remember you don’t have to make every ingredient from scratch. Incorporate theme nights—tacos, soup and salads, or breakfast for dinner—to add structure to the week and simplify planning. Keep it simple by picking a protein, a vegetable, and a grain. And make sure to build healthy meals—with plenty of fruits, vegetables, whole grains, fiber, and lean protein in whatever is decided. Assign age-appropriate tasks: You aren’t going to give your toddler the cleaver. But there are jobs in kitchen that are suited for certain age groups. Kids under 5 years old can wash produce, count, measure, and even hand mix. Older kids (8 and up) can read recipes, stir food, grate, and even chop with some extra protection and supervision. If you’re looking for a more comprehensive list of tasks, separated by age, this is a great resource. Set up for safety and mess-minimization: Make sure everybody has their workstation set up for the tasks they can safely perform. Place the younger kids away from the heat and sharp objects. Provide aprons and have kids work over sheet pans for easy cleanup. Prepare some ingredients beforehand: It’s not cheating to have some ingredients ready to go into the pan—especially if they’re difficult to prepare or can make a mess. One good example: have raw chicken diced and ready to go in the pan if you’re making a stir fry. Serve up guidance and compliments: You don’t have to be a chef to teach cooking basics to kids. Guide kids through the tasks until they’ve mastered them. And make sure they know when they’ve done a good job. Compliments count. Don’t rush: Parenting is an exercise in patience. Cooking as a family is no different. Schedule extra time to prepare and cook the meals you make with your kids. And it’s a cliché, but the experience is actually more important than the end product. Eliminate distractions: To get all the benefits of cooking with kids, turn off the TV and have everybody put down their phones. This will foster more conversation and enhance the quality time you spend as a family. Have fun: You don’t need to have a food fight to enjoy your time in the kitchen. Mostly it’s about managing your expectations, leaving time to learn, laugh, and love what you’re doing. The fun you have making dinner will translate into the finished product. Cooking as a family doesn’t have to be daunting. Preparing properly are the keys to a successful and (relatively) stress-free experience. And remember, when you’re cooking with kids you’re not just making a meal—you’re developing skills, confidence, and habits for a lifetime.